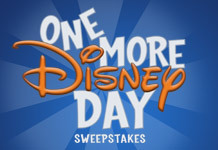 Starting New Year's Day and going through February 29, 2012, Disney Parks.com is giving away a vacation package every day for a total of 60 five day/four night vacations for 4 to either Walt Disney World Resort or Disneyland Resort. This sweepstakes is in celebration of Leap Day 2012. And also to celebrate Leap Day 2012, for the first time ever, both Disneyland Park and Magic Kingdom Park will be open for 24 hours straight beginning February 29 at 6:00am. So now you can get double the fun in your Disney trip for one day. In order to enter the contest, you need to have a Disney account. If you have been to Disney and booked your reservations online or ordered tickets online, you probably already have an account. I went to Disney two years ago and my online account was still active so I entered the contest in less than 10 seconds. Everyone is allowed to enter daily.